The International Watch Company (IWC) is renowned for producing innovative watches that are superbly crafted as well as beautifully designed. The brand has a fascinating history, deeply rooted in bold American entrepreneurship and the rich traditions of Switzerland’s Schaffhausen area. IWC’s six signature watch families, offering everything from diving to dress watches, have remained popular around the world for decades. These include the firm’s Pilot’s watches and its famed Portugieser line, which honors the illustrious history of Portuguese navigation. IWC is also highly-respected for its commitment to sustainability and its philanthropic collaborations. For example, the firm works with the Charles Darwin Foundation to aid in conservation of the Galapagos Islands. Who Founded The International Watch Company? IWC’s original founder was Florentine Aristo Jones. an American engineer and watchmaker. Before establishing IWC in 1868, Jones worked for the prominent Boston watch firm, E. Howard Watch and Clock Co. Though Jones was only in his twenties, he had already advanced to deputy director and manager of the company. Yet the ambitious Jones had his heart set on starting his own watch manufacture. At the time, most young men seeking fortune headed westward, but Jones’s vision for his new venture led him overseas. He aimed to reach new heights in watchmaking by combining state-of-the-art American technology with time-tested Swiss craftsmanship. So Jones set off for Switzerland, bringing with him all the latest and greatest in modern watch manufacturing machinery. Next, he needed to assemble a team of Swiss watchmaking experts and find a suitable place for IWC’s headquarters. However, Jones had difficulty winning over the famed watchmaking communities in western Switzerland. The well-established watchmakers there were skeptical of Jones’s unorthodox business plan and thus wouldn’t work with him. But Jones persisted and managed to find support in the northern Schaffhausen area. One prominent early supporter of Jones was experienced pocket watch manufacturer Johann Heinrich Moser. Incidentally, Moser had recently established a hydraulic plant in Schaffhausen. This plant, powered by the nearby Rhine River, reliably supplied electricity to local businesses at a low price. Such a plentiful source of electricity was just what Jones needed to run his high-tech equipment. And so, the International Watch Company finally found its home in Schaffhausen. Only several years later, in 1875, IWC moved from the Moser Industrial Complex to its own factory. This factory, built in Baumgarten – right next to the Rhine riverbanks – remains the company’s headquarters to this day. Jones himself was a talented watch designer as well as a shrewd businessman. His pocket watches sold well on the American market for both their cutting-edge mechanisms and fine finishing. Today, vintage IWC pocket watches containing “Jones movements” are highly coveted as collector’s items. In 1880, Jones sold IWC to the Rauschenbachs, a family of engine manufacturers, and returned to America. Afterwards, IWC continued to thrive and remained in the Rauschenbach family for four generations. Under Rauschenbach leadership, IWC produced many innovative pocket watches. For instance, in 1885, IWC was the first to release pocket watches with digital hours and minutes displays. The company went through many changes of leadership and direction over the next century. In 1903, the famous psychologist Carl Jung and the industrialist Ernst Jakob Hombeger married Rauschenbach daughters Emma and Bertha. The company was then owned by Jung and Homberger, until Homberger bought Jung’s share in 1929 and became sole owner. Ernst Jakob Homberger led the company through the tumultuous world war and post-war years. He oversaw the release of some of IWC’s most iconic designs and innovations. After Homberger’s death in 1955, his son, Hans Ernst Homberger, took the lead at IWC. Hans Ernst Homberger was an Olympic champion rower, and under his lead, IWC delved into timepieces for sports and diving. In 1978, IWC was acquired by German manufacturer VDO Adolf Schindling AG. Amazingly, through all these changes in leadership, the company has never interrupted its legacy of watchmaking excellence. Today, IWC has continued to thrive as part of Swiss luxury goods group Richemont. When Did IWC Wristwatches Become Successful? IWC’s first wristwatches were released in 1899, and the firm produced its first calibers designed specifically for wristwatches in 1915. However, it was during the 1930’s, after the launch of two landmark collections, that IWC wristwatches really took off. IWC is remarkable in focusing on six “watch families” that have remained bestsellers through many generations. The company manages to preserve the essence of each line while also keeping up-to-date with the latest features and styles. With this collection, IWC pioneered the classic “cockpit instrument look” that’s now ubiquitous among pilot watches. Yet the striking appearance of these watches isn’t just stylish but also keenly functional. During flights, pilots need to be able to quickly read, wind, and adjust settings on their watches. Large, clearly-marked dials and over-sized crowns make Pilot’s Watches easy to use even while wearing flight goggles and padded gloves. Models in this family are engineered to be tough enough to be worn on-board even during the most perilous flights. The company tests new models exhaustively for temperature, pressure, and impact resistance as well as protection against magnetic fields. The first “Special Pilot’s Watch,” developed especially for civil airmen, was released in 1936. IWC designed the watch to be highly temperature resistant – operable from -40 C to 40 C. Other features useful for pilots were its anti-magnetic escapement and rotatable bezel for marking take-off times. Later, IWC would also supply service watches for pilots in the Royal Air Force. These “Mark 11 Navigator” watches were issued to British air force personnel, and those of other Commonwealth nations, from 1949-1981. Over the years, IWC introduced Pilot’s Watches with a wide range of complications, such as chronographs and date displays. For example, the “Timezoner Chronograph” is a stunning contemporary Pilot’s Watch that allows timezone setting via a rotating bezel. This impressive model combines several new unique technologies into a watch perfect for pilots and other globe trotters. The bezel’s “city ring” only moves if squeezed from both sides, guarding against accidental timezone shifts. Turning this ring simultaneously moves the hour hand, 24-hour day/night display and date window to the correct positions. The popular Portugieser line is instantly recognizable from its large size and distinctive style hallmarks. Portugieser watches feature “railroad track” charter rings, delicate feuille (leaf-shaped) hands, and bold Arabic numbering. IWC also equips modern Portugieser models with perpetual calendars, minute repeaters, and other intricate, top-of-the-line complications. You can read up on various watch complications on our Watch Parts Guide. The Portugieser was born after two Portuguese importers came to IWC with a seemingly strange request. They needed wristwatches with the high precision of marine chronometers. So, they asked IWC to fit precision pocket watches with wrist straps. At the time, wristwatches were crafted to be small and unobtrusive by convention. But these large watches quickly caught on, and IWC made history by introducing the style, which is quite popular today. For IWC’s 125th birthday in 1993, the Portugieser line was honored with a limited edition anniversary model. Since then, the company has worked intensively in designing Portugieser models containing the most exquisite, difficult-to-craft complications. Retrograde date display – shows the day of the month and “jumps” back to the 1st at month’s end. However, the crowning glory thus far for the Portugieser family is the Sidérale Scafusia. IWC declares the Sidérale to be its “most exclusive and complicated” watch ever offered. An accomplished team of watch experts, engineers, and scientists collaborated for 10 years to develop the Portugieser Sidérale Scafusia. The watch features a stunning constant-force tourbillon and a star chart with horizon, sidereal time, sunrise/sunset, and twilight displays. Each and every Sidérale watch is custom-made by IWC’s master watchmakers. The star charts are drawn according to the buyer’s chosen reference location and the components individually assembled and adjusted. Aside from the watch’s masterpiece complications, it also retains the classic Portugieser look and user-friendly features such as battery-powered winding. The Ingenieur is IWC’s line of sporty / racing watches. In developing Ingenieur models, IWC designers aim to make watches rugged enough to withstand extreme weather conditions and harsh impacts. The collection is also noteworthy for its wide variety of avant-garde materials, such as high-tech ceramics commonly employed in motorsports. The original Ingenieur was inspired by IWC’s passion for precision enginering. The company wanted to push the limits in precision timekeeping while also creating an incredibly durable watch. And so, the first Ingenieur had high shock, water, and temperature resistance as well as reliable shielding against magnetic fields. IWC continually improved the Ingenieur’s functionality and design, and even managed to break a world record for antimagnetic watches. The 1989 Ingenieur 500’000 A/m withstood a 3.7 million A/m magnetic field when tested in magnetic resonance scanners. Just like the other watch familes, IWC introduced chronographs, perpetual calendars and other useful new complications to the Ingenieur line. Yet the Ingenieur’s signature qualities are still its durability and robustness. This has made the line a favorite among racecar drivers and athletes. In recognition of this, IWC has recently launched a number of limited edition racing and sport Ingenieur watches. Many of these honor IWC’s partners and brand ambassadors, such as Mercedes-AMG and Olympic cyclist Fabian Cancellara. However, the classic sporty steel Ingenieur models remain popular. The updated design has a sportier dial and a bracelet strap with alternating links of polished and satin-finished steel. The strap is equipped with a “one-touch” mechanism that allows the wearer to make fine size adjustments with one hand. The Aquatimer is IWC’s diving watch.The brand offers varying grades of pressure resistance to suit both amateur and professional underwater pursuits, including deep-sea diving. The first Aquatimer was launched in 1967, a time when diving as a sport was quickly gaining in popularity. With its sporty dial and checkered strap, the Aquatimer was a handsome watch for any diving enthusiast. But it was also packed with solid practical features for diving. This included a case watertight to 200 meter depths and a rotatable bezel for marking diving times placed underneath the glass. IWC greatly increased the Aquatimer’s pressure resistance over the years. Today, the brand offers 12-20 bar resistance for professional scuba divers, and even 100-200 bar models for deep-sea divers. As with the Ingenieur, IWC released an impressive array of limited edition Aquatimers in recent years.These celebrate IWC’s partnerships with organizations that support achievements in marine science and conservation, such as the Cousteau Society. However, the line remains dedicated to the exacting needs of divers and contemporary models offer many new innovative functions. For example, the 2014 “Deep 3” Aquatimer features a special mechanical depth gauge. This gauge simultaneously displays the diver’s current depth and maximum depth for a given diving session. This family of watches is a beautiful homage to the inventive genius of Leonardo Da Vinci. True to its namesake’s legacy, some of IWC’s most remarkable innovations were introduced in this line. The original 1969 Da Vinci was IWC’s first watch containing the groundbreaking, extremely accurate “Beta 21” quartz movement. The Beta 21 was the first Swiss-made quartz movement, and was developed in collaboration with several other Swiss watchmakers. You can find the histories of other Swiss watch firms on our Watch Brands page. Then, in 1985, IWC equipped a Da Vinci with its autonomous perpetual calendar – yet another revolution in watchmaking. Designed by legendary watchmaker Kurt Klaus, IWC’s perpetual calendar system is crown-operated and displays the date, day, month, and year. It’s designed to run accurately, even accounting for leap years, for the next 577 years. Thus, such a watch can passed down through many generations without ever needing date adjustment. The 1985 model also changed drastically in appearance. Gone were the square face and gold bracelet strap of the original. The new Da Vinci sported a more refined look, with leather straps, a grooved, double-framed case, and a symmetrical dial. This Da Vinci incarnation became one of IWC’s best-selling watches of all time. Contemporary Da Vinci models tend to follow the style footprint of the 1985 Da Vinci rather than the original. In addition to offering Da Vinci models with more complex complications, IWC has also focused on further refining the design. In particular, the brand has been working on models that appeal to women as well as men. Decorated date windows, gem-studded bezels, articulated strap horns, and curved lugs are some lovely details introduced in recent models. The Da Vinci Perpetual Calendar Chronograph, shown at far right above, also features exclusive Santoni alligator leather straps. Santoni, a luxury Italian shoemaker, supplies IWC with artisanal hand-finished leather with nuanced shading and a patina-like sheen. This family is one of IWC’s most popular. It’s named after Portofino, Italy, the picturesque fishing village famous for its beautiful harbor. Portofino designs are known for being particularly elegant, with clean, uncluttered dials and slim round cases. From the beginning, they’ve been in high demand among both male and female watch enthusiasts. Some Portofino models feature a breathtaking back engraving of the Portofino harbor, as shown at right. The first Portofino, the “Portofino Hand Wound Moonphase,” was released in 1984. The design of its over-sized yet minimalist case was actually based on the style of vintage moon phase pocket watches. The dial, with its slim Roman numerals and Breguet-style hands, further enhanced the watch’s vintage feel. The sleek, timeless look held wide appeal, and IWC included the Portofino as one of its permanent offerings. Through the years, IWC has added many handy complications, such as a rotating date display, to the Portofino line. But most remarkably, the company has achieved heightened elegance and comfort by engineering stunningly thin cases for Portofino models. For example, in 1995, IWC launched the “Romana Perpetual Calendar.” This Portofino was one of the thinnest watches in the world containing a perpetual calendar. IWC continues to draw upon the “laid-back lifestyle of the Mediterranean” as inspiration for Portofino designs. Various complications are available for the line, but many Portofino offerings are still hand-wound moon phase watches. IWC designers have also managed to add more luxurious details while retaining the Portofino’s understated appeal. For example, examine the the Portofino Automatic Moon Phase 37, shown at right above. It has a silver-plated dial, diamond-studded bezel, and a case and 60s-inspired Milanaise mesh strap in 18-carat red gold. IWC is not only known for its exquisite watchmaking, but also for its high-principled corporate philosophy. As a major corporation, IWC firmly believes it has a responsibility to help protect the environment and those in need. To honor its commitments to bettering the world, the firm has partnered with several prominent environmental and social justice organizations. We’ve already mentioned the Charles Darwin Foundation and the Cousteau Society. These organizations honor their illustrious namesakes by furthering scientific exploration and environmental conservation. IWC supports its partners with a percentage of the sales from its limited edition watches. But the company also sometimes gets more directly involved in its partner organizations’ projects. 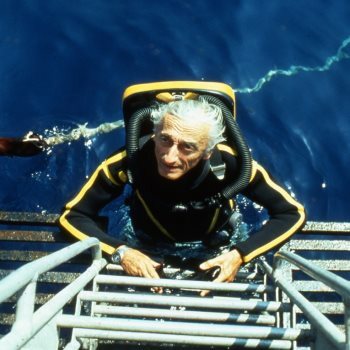 For example, in 2004, IWC joined Cousteau Society researchers on an anniversary expedition to the Red Sea. The watch firm also helped the Society refurbish the Calypso, a legendary research vessel extensively used by Cousteau himself. The Laureus Sport for Good Foundation aims to support sporting excellence while also improving the lives of youth and children around the world. The foundation hosted over 140 projects for children and adolescents, and also runs high-profile award events to recognize top athletes. Antoine de Saint-Exupéry was a legendary French aviator and writer. His foundation focuses on educational projects for disadvantaged children and youth from all over the globe. We hope you enjoyed this look at the International Watch Company’s early history, signature watch families, and sponsorships. For more about IWC manufacturing, current models, and corporate history, visit the official website. Or alternatively visit Bespoke Unit’s watch brand histories and current news pages. Reviewed by Paul Anthony, on 29 September 2017 . "Swiss-American Horology Innovation. IWC Watches combine bold American entrepreneurship and the rich traditions of Switzerland's watchmaking pedigree to create game-changing timepieces."